Good Tuesday Morning Everyone! I hope each of you are in good spirits! Today's tool is the Stampin' Up Brayer. I have two in my toolbox! It's main use is for making special-effect backgrounds and uniformly inking large stamps such as the Medallion Stamp. With a large handle and soft rubber attachment, it's a great tool for your papercrafting projects. 1. Stripes: using markers, make stripes on your brayer (this works best if you lie it on its back and turn the roller while holding the marker) all the way around until the beginning and ending stripe meet. 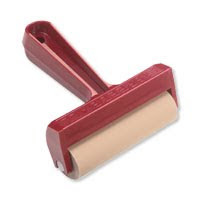 Roll brayer across your paper in whatever direction you desire. 2. Squiggles: Repeat the same process as for Stripes but make wavy lines instead of straight ones. 6. Reverse/mirror Image: Color your stamp, rubber side up and roll the brayer over the image several times, then roll over your paper (works great with trees, flowers etc). 7. Mirror Image: If you have an image that you want to face each , you would brayer over the stamp like above and then roll onto your paper then stamp the original image nose to nose with the first. 8. Kissing: Brayer over a background stamp, then use your other stamps and stamp onto the background stamp then stamp onto your card stock - your solid stamp now has a design and you have just multiplied your uses of one set. 9. Ghosting: Stamp an image on your card (say the Snowflake from the "Snowflake" set) several times in clear embossing ink. (DO NOT EMBOSS) Then brayer over your invisible images with regular dye pad and your snowflakes will start to appear. 10. Resist: Works best with glossy paper. You will need to choose your resist medium; ink, wax or other. You color on the glossy card stock with the pens in any way, or pattern you choose then you use the same technique as the ghosting by brayering over with a different color. The pattern that you drew or colored will not let the brayered ink absorb through the card stock therefore comes the "resist". If you would like to purchase the Stampin' Up Brayer, click here. Enjoy!